When you don your Derby Day-best, no other cufflinks will do. This winning set is fashioned out of wood sourced from one of the Kentucky Derby's most storied sites, Churchill Downs. These one-of-a-kind accessories are made from authentic wooden beams and trusses from the 1903-1923 paddock and let Derby devotees proudly wear a piece of this beloved site's history. The wood supported the paddock in which prized thoroughbred horses were showcased and mounted before races. Finished with sterling silver bezels. 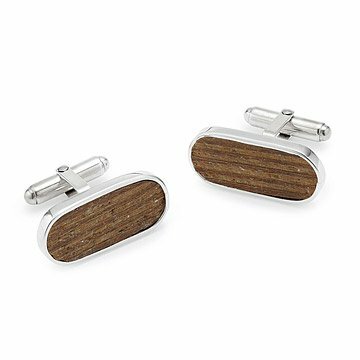 Officially licensed by Churchill Downs Racetrack, each pair of cufflinks comes gift-boxed with a certificate of authenticity. Handmade in Berkeley, California. Periodic cleaning with silver cloth. Traditional Fifth Anniversary Gift - Wood! My husband and I give each other the traditional gift for each anniversary (i.e. first = paper, second = cotton, etc.). I was a bit stumped by the fifth anniversary gif - wood - at first, until i came across this awesome gift. My husband is a Kentucky native and has fond memories of attending the derby at Churchill Downs. He loves to French cuff shirts and unique cuff links, so I knew I found a total winner in these cufflinks. And he ADORES them! An unique gift that is a fun conversation piece. This winning set is fashioned out of wood sourced from one of the Kentucky Derby's most storied sites, Churchill Downs.